Get ahead of your debt simply by getting to know your customers. It’s the mantra of almost any business: know your customer! Marketers, salespeople and customer service reps looking to provide a fantastic customer experience follow it to the letter. But it’s also a concept that has particular significance when you’re juggling the demands of small business accounting. If you’re a small business extending credit to a customer, you need to be comfortable you have sufficient customer information to base your decisions on, and the skills to spot the warning signs of potential non-payment. As cloud accounting giant Xero pointed out recently - eight days late for one invoice has the power to cripple a small business. As we’ve previously discussed, there are some basic things you can do to know your customer like credit checking and managing the impact of late payers. But how much of a difference does solid customer information make? Does having any extra contact phone numbers mean anything? And if you hang onto an unpaid account for ages, what are the risks? 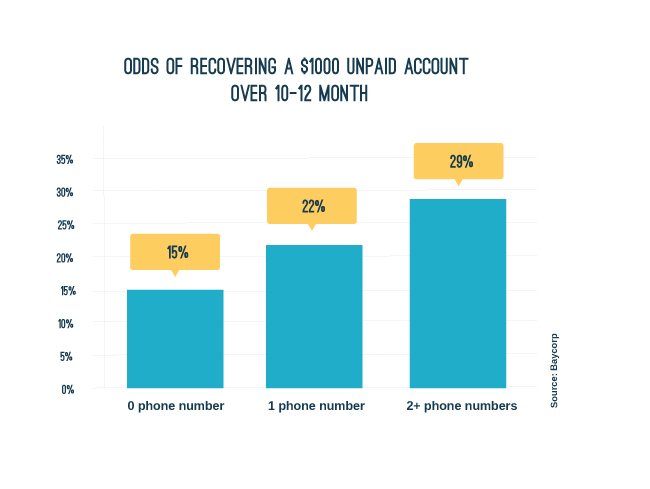 As shown in the below chart, having more than one phone number significantly improves the odds of getting back an unpaid account (assuming all else is equal e.g. a similar sized, similar aged debt in the same industry). In the case shown here, having two phone numbers almost doubles the odds compared to not having a number! That’s a massive difference. The impact of time – how old debts are bad! What can we take from the above? First, information is gold. Get more than one phone number on a customer when you give credit. We know for a fact that more than one phone number can make a difference if things go bad and non-payment becomes a problem. Second, act fast. 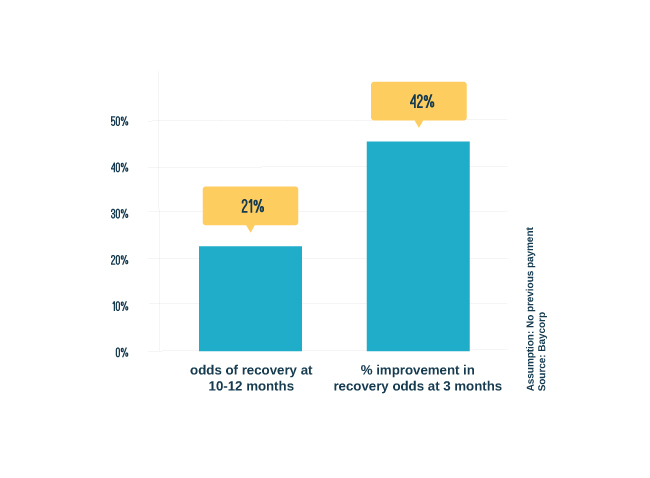 If non-payment becomes a problem, speed improves the likelihood of you being able to recover the money yourself. If you have a customer with a large invoice who hasn’t paid three months after their purchase, and it’s is proving difficult to contact them, you need to consider a Resolution Specialist. “It’s essential for a small business to be prepared. This means getting the right information upfront on customers you’re giving credit to, having a clear invoicing process and seeking help quickly (preferably at the 90-day mark) if you suspect you’ve got a problematic customer. This will help you manage the financial and emotional pain should customers not pay. Make sure you're set up to avoid debt this Christmas with Baycorp's Top Tips - a recent presentation to NZCFI Members. Debt collectors are chasing more builders as the money they owe skyrockets.